Rent or buy The Incredible Hulk here. After Director Ang Lee's (Sense and Sensibility, Crouching Tiger, Hidden Dragon) artsy-fartsy take on The Hulk tanked at the box office a few years ago, things looked dire for the big green dude. So what was in order? Recast the franchise, get a new director, and basically pretend the first one never happened. This is a reboot of the Hulk franchise, and it's a credit to the filmmakers that I very much enjoyed this film, given that I have no history of giving a crap about the Hulk or his tendency to smash things. I've always looked on the character with mild disdain, writing him off as a Jekyll & Hyde-type on steroids. But this Hulk kept me entertained from start to finish. Credit must be given to Edward Norton, whose Bruce Banner is a lonely, tortured soul who struggles to keep the rageful beast within him at bay. Norton makes a sympathetic lead, and he does some fine character work here. Nothing amazing, ala Christian Bale or Robert Downey Jr., but solid nonetheless. Liv Tyler does just fine (though there's sure to be some inexplicable hatred for her by the public…there always is for the love interest in superhero movies! I don't get it. I liked Katie Holmes, Kirsten Dunst, and Kate Bosworth just fine). William Hurt, Tim Roth…the entire cast turns in good performances. The cinematography is excellent (some stuff in Brazil is particularly eye-catching). The pacing is great, and while there is some down-time between Hulk moments, the film doesn't lag. This is a much more somber movie than the crowd-pleasing Iron Man, but the handful of attempts at humor hit the mark just fine. 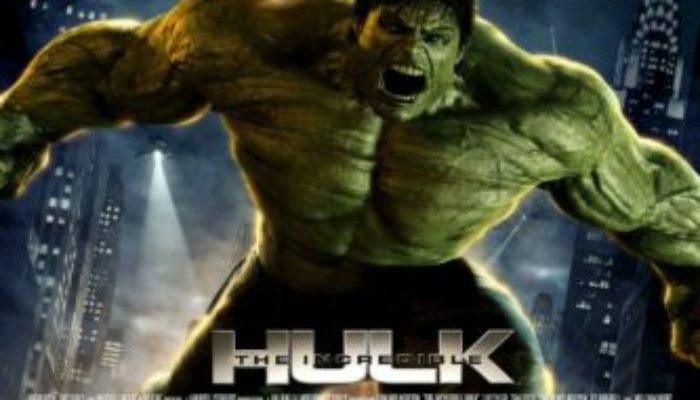 Most importantly, the film gives you a good dose of Hulk smashing things real good. The CGI on the Hulk is far better than the trailers made me think it'd be (with a few exceptions). The action in this movie is fantastic, visceral, hard-hitting stuff. You truly feel the physical power of the character, and a couple moments startle you with their raw power. The final battle in particular is a lot of fun. I really enjoyed the exploration of the villain's motives (villains who think they're doing the right thing are always more interesting), as well as Bruce's desire to control his demons. Good people have a dark side, and bad people often have some virtue left in them, and this movie explores that idea to good effect. Another hard-hitting superhero flick with a downtown showdown is The Incredibles. Rent or buy it here!